Few question ‘environmentally friendly’ rail even as it smashes a hundred miles of tunnels through the Alps and, despite soaking up most EU transport funding, fails to tempt freight off the roads. Also, no news on when flooded A10 Orleans might reopen. MPs criticise ‘rushed’ £250 million M20 truck park. Contracts inked on Germany-Denmark 18km undersea tunnel. World’s longest tunnel highlights EU failure to tempt rail from roads. Nothing can take away from the achievement. 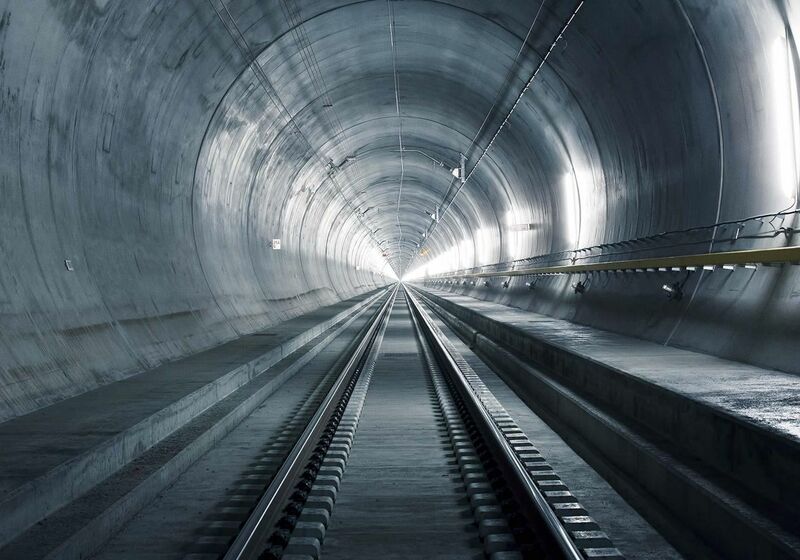 Despite the seventeen years it took to build, the Gotthard Base Tunnel was actually finished six months ahead of time. The €11 billion budget over-ran by just 21 percent, well under the European average of 27 percent (according to DW.de). At 35.5 miles (57.1km), GBT is the world’s longest tunnel and also the deepest, buried beneath up to 2300 metres of rock on the way between Altdorf and Biasca in central south Switzerland – a central part of the European Rhine-Alpine Corridor between Rotterdam and Genoa. More than 300 high speed trains will pass through each day when commercial services start in December. GBT is one of a number of new Alpine rail tunnels including the under-construction Brenner Base Tunnel and the soon-to-start Lyon-Turin line. All together they will amount to more than one hundred miles of fresh tunnelling through the Alps. Opposition to the Lyon-Turin line has been fierce, but otherwise all this destruction has passed without objections – despite the oft-cited ‘fragile Alpine ecosystem’ – presumably because all these projects promise to move freight off the roads (so-called ‘modal shift’). Switzerland actually already does very well with modal shift. Rail currently carries just under 70 percent of all freight according to Trasporto Europa. Within the EU however, modal shift has been an abject, expensive failure. ‘Shippers clearly prefer road over rail for transporting goods,’ it says. Not to be put off, the EU continues to plough money into trains. Of the €12.8 billion allocated under the first round of CEF Connecting Europe Facility funds this year, €9.5 billion went to rail according to the Commission. As drivers across the Continent complain about the state of the roads they may want to stop for a moment to consider where all their money has gone. roundup: OPERATION STACK. The Transport Committee of UK MPs calls the decision to spend £250 million on a 4000-strong truck park beside the M20 – the size of Disneyland California, and the world’s second biggest – ‘rushed’ and says the government has failed to make the case. The park is intended to replace the Operation Stack truck queue which closes the M20 during major delays at the Channel ports and Eurotunnel. The FTA Freight Transport Association says it understands the Committee’s reservations but is concerned it will merely prolong the misery for Kent residents. Last week Balfour Beatty was awarded a £130 million contract to build the truck park element despite the location not being finalised. It should at least partly open by summer 2017. FEHMARN TUNNEL. It’s a big week for tunnels. Yesterday, French construction giant Vinci – which, incidentally, also operates a large network of toll roads in France – inked contracts to design and build the 18km ‘Fehmarn Belt’ road and rail tunnel between Germany and Denmark. The three agreements, with a combined value of €3.4 billion, cover construction of the tunnel itself, the factory to make the interlinked pre-fab concrete tubes which will be laid on the seabed, plus the surrounding infrastructure. It will be the world’s longest road and rail tunnel and will cut the journey time to ten minutes by car, from an hour currently by ferry or the 160km drive up through and across Denmark. An end date is not mentioned, and has been subject to some slippage, but it should be ready by early next decade.